The Convention on the Rights of Persons with Disabilities (CRPD) is an international legal agreement. It exists to protect and promote the human rights of disabled people. The UK signed the treaty in 2009 – a commitment to promote and protect the human rights of disabled people. You can read the full text of the Convention on the UN website. It is also available in an easy read format. Each United Nations (UN) human rights treaty has its own timetable. 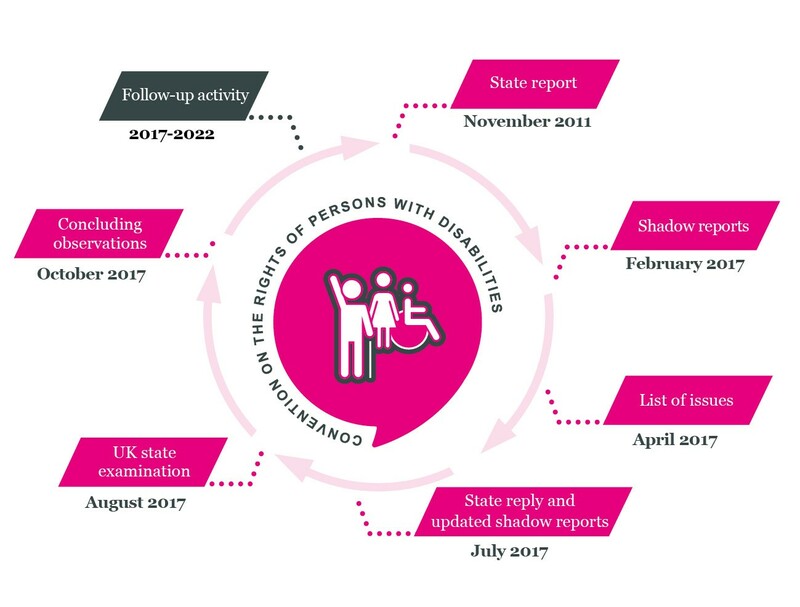 In 2017 we published our CRPD shadow report ahead of the UK state examination in August 2017. After the examination the UN made their concluding observations, outlining their concerns about disability rights in the UK. We worked jointly with the Scottish Human Rights Commission, the Northern Ireland Human Rights Commission and the Equality Commission for Northern Ireland to produce an update report for the UN Committee on the Rights of Persons with Disabilities. The report notes the progress that has been made by UK governments to put in place the recommendations made by the Committee in 2017 to improve the lives of disabled people in the UK, as well as the areas where improvement is needed. We submitted a briefing to give an overview of our key concerns about the lack of government progress in protecting the rights of disabled people in the UK. We produced a plain English version of the UN's recommendations for the UK, as well as an easy read summary, a British Sign Language (BSL) video and a Welsh translation, so that disabled people know what the government has been asked to do. The UK Independent Mechanism (UKIM) – made up of the Equality and Human Rights Commission, the Scottish Human Rights Commission, the Northern Ireland Human Rights Commission and the Equality Commission for Northern Ireland – provided a shadow report to the UN Committee on the Rights of Persons with Disabilities. We made 130 recommendations for change across 14 priority areas. Read the submission: Disability rights in the UK: updated submission to the UN Committee on the Rights of Persons with Disabilities (includes links to PDF, Word, easy read, BSL and Welsh language versions). We published a guide to help disabled people know their rights under the Convention and how to use them. We sent a letter to the Minister of State for Disabled People in response to a CRPD Committee inquiry (Word) with an attached annex outlining our key concerns (Word). We received a response in January 2017. For more information about CRPD Committee inquiries, see below information on 'UN Committee on the Rights of Persons with Disabilities'. The Committee sometimes issues ‘general comments’ which explain how CRPD can be applied in specific situations. You can find these on the UN website. The UK government has signed the CRPD Optional Protocol. This means that disabled people can complain to the Committee on the Rights of Persons with Disabilities if they feel their Convention rights have been breached, and if they have already tried all other ways to achieve justice. It also means the Committee can investigate allegations of serious or common violations of Convention rights. In 2014 the UN Committee launched an inquiry into the UK under Article 6 of the CRPD Optional Protocol. A variety or organisations, such as disabled people’s organisations, submitted information to the inquiry. We also made submissions. In November 2016 the UN Committee published its report, which concluded that there was reliable evidence of serious or systematic violations of the rights of disabled people in the UK. It made a number of recommendations, including a recommendation for the UK government to carry out an assessment of the impact of their policies since 2010 on disabled people. The UK government's response to the inquiry rejected the inquiry’s conclusions. It is too early to judge the impact of the inquiry for disabled people’s rights in the UK. However, the inquiry process provided an independent platform for disabled people to voice their grievances. The inquiry can also be used in ongoing efforts to seek action from the UK government. States that ratify the CRPD are required to set up or appoint an independent body known as an ‘independent mechanism’ to monitor the implementation of the Convention. The Commission is a member of the UK’s independent mechanism, alongside the Scottish Human Rights Commission, the Northern Ireland Human Rights Commission and the Equality Commission for Northern Ireland. In its work on the CRPD, the Commission often works jointly with the other members of the UK Independent Mechanism, for example when producing our shadow reports to submit to the UN Committee. In 2014 the UN Human Rights Council created the role of UN Special Rapporteur on the rights of disabled people. Part of this role is to report annually to the UN Human Rights Council and General Assembly with recommendations on how to better promote and protect the rights of disabled people. The Commission is chair of the CRPD Working Group of the European Network of National Human Rights Institutions (ENNHRI). One of the Group’s main aims is to support international cooperation on promoting, protecting and monitoring the implementation of the Convention. Our Disability Advisory Committee informs and advises on the Commission’s work to protect and promote rights and equality for disabled people. The Committee supports the Commission in monitoring and reporting on CRPD.